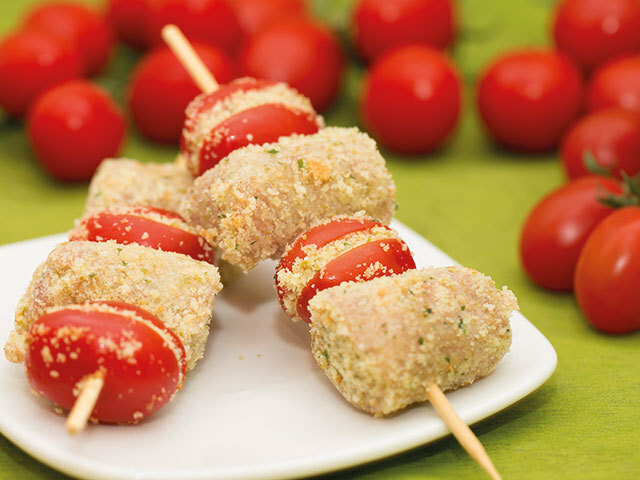 To help you to eat meat even in hot weather, Glem suggests delicious light, tasty kebabs. The ingredients for the breadcrumb coating are listed in decreasing order of quantity. Provided this order is maintained, quantities can be varied to taste. Place all the coating ingredients and blend to a soft, even mixture. Coat the veal slice with the mixture on both sides. Place the breaded slice of meat on a worktop, roll it up tightly then cut in half to form two spirals. Cut the tomatoes in half and empty them, removing the liquid and seeds inside. Place one spiral of meat on the kebab skewer, fill a tomato with the breadcrumb mixture, closing the two halves onto each other, and fit it on the skewer, then add the other spiral of meat and the other tomato, stuffed in the same way, in a meat-tomato-meat-tomato sequence. Oil the bottom of a non-stick frying pan with oil, place the kebabs inside and put the lid on. Cook for 5-10 minutes over medium-low heat, remove the lid and check cooking. If the kebab is brown on one side it is ready for turning over to finish cooking on the other side. The idea for this kebab came from a cooking course I attended with butcher colleagues from Modena. My mother and I were inspired by one of the chef's ideas and made a few changes to adapt the recipe to the type of products we offer for sale in our delicatessen.